Explaining the evolution of cooperative behavior is a long-standing problem for which much theory has been developed. A recent paper in BMC Biology tests central elements of this theory by manipulating a simple bacterial experimental system. This approach is useful for assessing the principles of social evolution, but we argue that more effort must be invested in the inverse problem: using social evolution theory to understand the lives of bacteria. The core principle of Darwin's theory of evolution is simple: entities with traits that maximize reproductive success will increase in frequency relative to their competitors. A naive application of this idea might suggest that natural selection should only favor organisms that boost their own output of offspring. However, nature is rife with cooperative behaviors that decrease the actor's reproduction and increase that of recipient organisms, and Darwin himself recognized that cooperation poses a serious challenge for his theory. In many cases, this dilemma can be resolved by considering the replication of genes separately from the reproduction of whole organisms. This perspective was first presented clearly by JBS Haldane and then formalized by WD Hamilton, who showed that a gene responsible for cooperative behavior will increase in frequency in a population if the cost c (decrease in lifetime reproduction) of producing the behavior is less than the benefit b (increase in lifetime reproduction) of receiving the behavior weighted by relatedness r, the likelihood that receivers of cooperation share the gene or genes controlling the cooperative behavior . In short, cooperation can evolve if rb >c. Hamilton's rule may seem quite simple, but r, b, and c are not static parameters; rather, they are dynamic variables that change with the cooperative behavior in question and the environmental circumstances in which that behavior is expressed. Rigorously testing Hamilton's rule therefore requires a highly tractable experimental system, for which culturable unicellular organisms are ideal candidates. Manipulating microbes to address basic ecological and evolutionary questions has a rich history. In a series of classic experiments, GF Gause used mixed cultures of Paramecium species and Saccharomyces species to test elementary theories of competition and predator-prey interactions. Various authors have also combined microbiology with ecology and evolution to explore topics ranging from host-parasite interactions to long-term experimental evolution (for example, B Levin, E Cox, R Lenski, L Chao, B Bohannan and others). Historically, many studies have assumed that bacteria lead solitary, asocial lives. On the contrary, prokaryotic microbes frequently live in dense populations, termed biofilms, and they interact extensively with each other by secreting a variety of extracellular compounds [2, 3]. Some of these compounds, such as the colicins of Escherichia coli and the pyocins of Pseudomonas aeruginosa, are weapons against competing microbial strains or species. Other secreted products may mediate cooperation, including polymers that lend biofilms structural support, chelating agents that sequester nutrients and enzymes that digest complex substrates into smaller units for subsequent import. Bacteria are thus gregarious and social, but their sociality presents a conundrum: extracellular products that are costly to produce and benefit other individuals ('public goods') can be exploited by individuals that reap the benefits of public goods without contributing to the pool . In a recent paper in BMC Biology, Brockhurst et al. use bacteria to test the efficacy of Hamilton's rule for describing whether cooperation can succeed against exploitation. Taking structural polymer secretion by Pseudomonas fluorescens and siderophore secretion by P. aeruginosa as two examples of public good production, they studied how changes in nutrient availability affect the ability of cooperative cells to resist invasion by exploitative mutants. When grown in beakers partly filled with liquid medium, strains of P. fluorescens that constitutively produce extracellular polysaccharide (EPS) form large groups on the liquid surface, which affords them better access to oxygen (Figure 1a). In this context, EPS is a public good that binds members of the surface-dwelling bacterial population together and anchors them to the beaker walls. These biofilms are invaded by spontaneous EPS-null mutants that take advantage of the structural polymer produced by others, thereby gaining access to high oxygen concentrations without investing in the public good. By diverting more resources into growth instead of paying the cost of cooperation, exploitative P. fluorescens mutants achieve higher division rates and compete successfully against EPS-producing strains (Figure 1b). 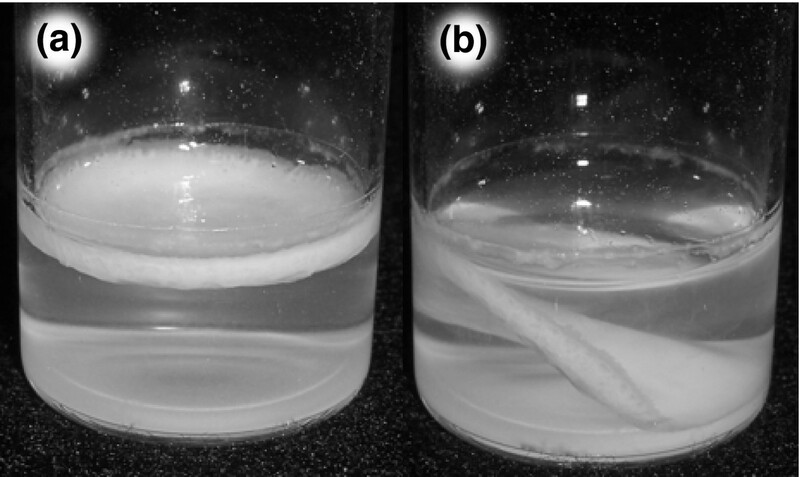 The Pseudomonas fluorescens experimental system studied by Brockhurst et al. . (a) The 'wrinkly-spreader' variant of P. fluorescens constitutively produces extracellular polymers that bind cells together and provide structural support for biofilms that reside at the liquid-air interface of medium in glass beakers. (b) Such biofilms are susceptible to invasion by mutants that do not secrete extracellular polymer, which eventually compromise the integrity of biofilms, causing them to sink into the liquid phase below. Photographs courtesy of Paul B Rainey. Using this system, Brockhurst et al. tipped the balance of Hamilton's rule in favor of cooperation by decreasing the relative cost of EPS synthesis; they achieved this simply by increasing the nutrient concentration of the liquid medium in their beakers. The rationale was that if nutrients were plentiful, diverting resources into EPS secretion would not substantially curtail growth rate, and in this particular experimental system, cooperative EPS-secreting bacteria resisted invasion by non-EPS-secreting mutants only when resources were abundant. The authors also assessed whether nutrient availability influences the evolution of another cooperative bacterial behavior: siderophore production by P. aeruginosa. When subjected to iron-limited conditions, P. aeruginosa secretes pyoverdine, which binds ferric iron and facilitates its interaction with specific membrane-bound import receptors. Pyoverdine-null mutants of P. aeruginosa outcompete wild-type cells when the two strains are mixed in iron-limited culture; the null mutants exploit pyoverdine produced by the wild type and grow faster without having to pay the cost of siderophore production. Increasing nutrient availability (excluding iron) and thereby lowering the relative cost of public-good production again reduced the competitive advantage obtained by mutants that exploit the pyoverdine secreted by wild-type cells . The experiments of Brockhurst et al. illustrate the basic validity of Hamilton's rule and the utility of microbial systems for testing evolutionary theory. This and similar studies have benefited the core ideas of social evolution [6–9], but many potentially important subtleties of bacterial sociality remain to be explored. Here, we offer two suggestions for future research. How do biofilm growth conditions influence social evolution? To understand the evolution of any bacterial behavior, we must determine the costs and benefits of that behavior to its actors and recipients in ecologically relevant settings. Varying the environmental circumstances of biofilm growth may dramatically alter the micrometer-scale spatial relationships between cells, which in turn determine who receives the benefits of a given secreted product. As a consequence, a single behavior can have opposite outcomes on competition in different growth conditions. For instance, whereas EPS secretion is at least partially cooperative within P. fluorescens biofilms grown in beakers, the same behavior mediates conflict in other contexts. In one example, Vibrio cholerae mutants that constitutively produce EPS rapidly and consistently outcompete cells that do not secrete EPS within biofilms grown on solid surfaces . More importantly, EPS secretion appears to be a competitive behavior in real-world biofilms: hypermucoid P. aeruginosa mutants that constitutively produce EPS often dominate fatal infections in the lungs of people with cystic fibrosis. Consistent with evidence that EPS secretion can mediate competition, theoretical work has shown that EPS-secreting bacterial lineages are better able to acquire nutrient-rich spatial locations near the biofilm surface and simultaneously suffocate neighboring cells that do not secrete EPS . How do bacteria regulate social behaviors? Theory predicts that the evolution and subsequent maintenance of constitutive public-good production is unlikely because the costs and benefits of cooperation vary dramatically depending on environmental context. Indeed, bacteria are not all-or-none social organisms but rather monitor their immediate surroundings and adjust their investment in social behavior accordingly. Many species accomplish this via quorum sensing, which entails the secretion and detection of diffusible molecules (autoinducers), whose concentration serves as a proxy for population density. Wild-type strains of P. fluorescens, P. aeruginosa and a multitude of other bacteria use quorum sensing to regulate their investment to EPS production and the secretion of siderophores and many other extracellular molecules [12–15]. As discussed above, cooperative public-good secretion can resist invasion by exploitative strategies if the secreted product is preferentially directed towards individuals that share the genes controlling public-good secretion. Cooperatively acting individuals can help other cooperators simply by diverting the benefits of a public good towards individuals with the same genotype, and we may therefore predict the evolution of mechanisms by which bacteria upregulate cooperative behavior when they are surrounded by clonemates. Bacteria that use multiple autoinducers for quorum sensing could be doing just this: individuals may track the ratio of two or more secreted autoinducers to distinguish between environments in which only cells of their strain or species are present and environments in which foreign strains or species are present (Figure 2). A hypothetical mechanism by which bacteria may use quorum sensing with two autoinducers (AIs) to determine whether a foreign species is present. The focal species secretes AI-1 and AI-2 at equal rates, and as long as only the focal species is present, the ratio of AI-1 to AI-2 remains equal to 1 as cell density increases (black line). Bacteria may use any ratio of two autoinducers; the important principle is that if only the focal species is present, then the concentration of one autoinducer should predict the concentration of the other according to a known conversion factor. 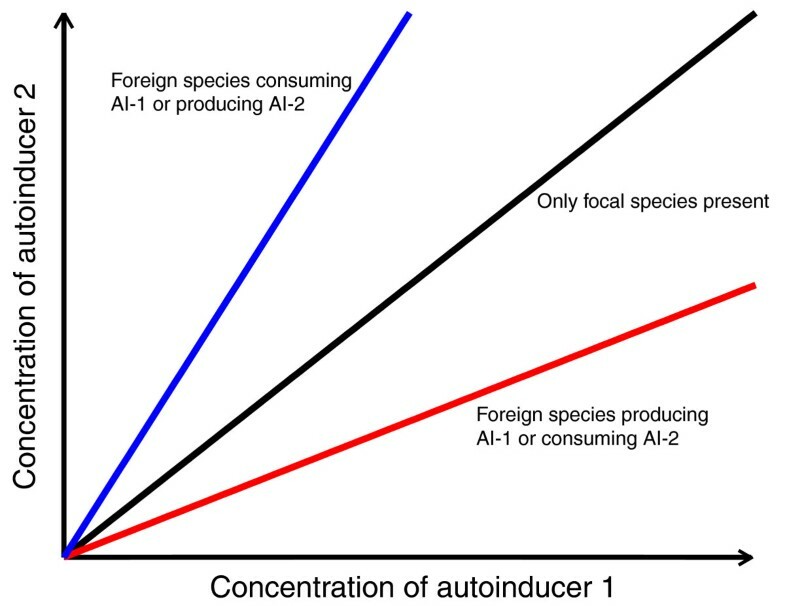 If other species are present that consume or produce AI-1 or AI-2, the ratio of the two autoinducers deviates from the expected value as cell density increases (blue and red lines). It is critical that we understand bacterial sociality in all its complexity, because group living and extracellular product secretion play important roles in bacterial pathogenesis. For example, P. aeruginosa uses quorum sensing to regulate biofilm formation, pyoverdine production and protease secretion in chronic infections on burn wounds and within the lungs of people with cystic fibrosis. The interaction between social evolution theory and microbiology holds enormous potential for enriching our knowledge of bacterial behavior, but to realize this potential we must ensure that information flows in both directions between these formerly disparate fields. At present, social evolution theory has benefited from simple experiments with bacteria, but microbiology has not equally benefited from social evolution theory. Correcting this asymmetry will require that we appreciate the spatial and temporal heterogeneity of microbial worlds and the regulatory mechanisms that bacteria possess to cope with the uncertainty of microscopic life. We are grateful to Katharina Ribbeck and Kevin Foster, whose comments helped to improve this manuscript. CDN is supported by a Robert May Fellowship and a Centennial Fellowship from Princeton University. BLB is supported by HHMI, NIH grant 5R01GM065859, and NSF grant MCB-0343821. SAL acknowledges support by the Defense Advanced Research Projects Agency (DARPA) under grant HR0011-05-1-0057.